In this study I explored the link between human resource training and organisational performance in a complex Public Service organisation. 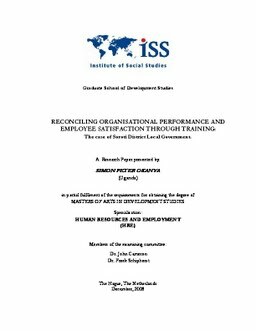 Drawing from a wide range of theoretical literature and also basing on my personal experience as an employee of the district, the study focuses on the complexities involved in reconciling organisational performance and employee satisfaction through training. Using the theoretical insights of the Human Capital Theory, the Human Resources Based View and the Capability Approach and the Universalist, Configurational and Contingency models of training, the main findings of this study indicate that there are overlaps in the theories and models in relation to training and these can facilitate or inhibit the development and utilisation of organisational or human potentials. Also, contrary to the existing literature on training, the research findings suggest that training episodes and returns can not simply be reduced to a dichotomy of general or specific, rather a more subtle differentiation is paramount.